Ray Toll, Lead organizer of the event, opens the conference. 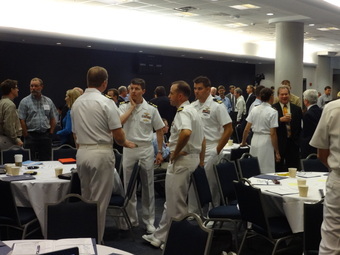 The conference brought together a wide range of stakeholders, including many representatives of the U.S. Navy. 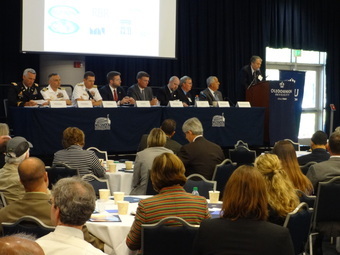 The panel discussing the Hampton Roads Pilot Project included representatives of the Navy, the US Army Corps of Engineers, State and local governments, and businesses. 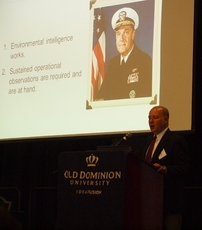 Dr. Richard Spinrad, Vice President for Research, Oregon State University and prospective Chief Scientist, National Oceanic and Atmospheric Administration shared his thoughts on the challenge of climate change and the urgent need for more environmental intelligence. The conference was concluded with a speech by E.P.A. 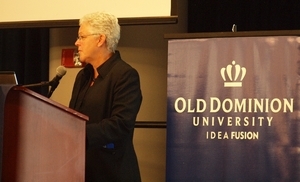 Administrator McCarthy, who ensured the audience that the U.S. President and the federal agencies are determined to do as much as possible to limit the changes in the climate. 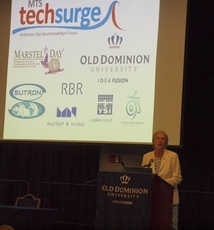 The Hampton Roads Section of the Marine Technology Society teamed with MARI in organizing a 'TechSurge' focusing on the theme of “Technical Support for Coastal Resiliency.” The event took place at ODU's Ted Constant Conference Center in Norfolk, Virginia. 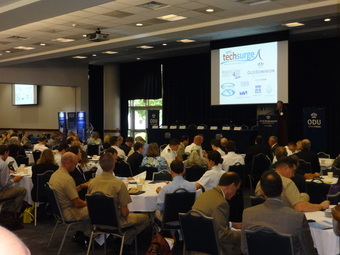 This event built upon the successful Hampton Roads Sea Level Rise/Flooding Adaptation Forum, which is funded by a grant from the Virginia Sea Grant to ODU and the Hampton Roads Planning District Commission (HRPDC) and on OCEANS 2012 MTS/IEEE Hampton Roads which was held in October 2012 in Virginia Beach. More than 203 civic leadership, municipal employees, planners, Navy, NOAA, industry partners and students from across the region attended. More information is available here. In case of questions, please contact the conference lead Ray Toll (rtoll at odu.edu). Sea level rise is causing increased flooding along much of our coastline. To adapt to this, engineers and decision makers need many types of information. This conference focuses on the technical capabilities required to produce the needed information. Document the sense of the conference - covering the stakeholder requirements, the research needed, and the emerging tools soon to be available to address sea level rise and increase coastal resiliency - as a summary report. Potentially, this documentation will support the creation of a regional task force to address sea level rise. 0730 - 0830 Registration and Exhibit Setup. 1300 - 1700: Technical Session: Integrated Observations. Each 20-minute session is followed by a 5-minute Q&A. 1625 - 1645 Why are Sea Level Rise and Flooding Accelerating along the U.S. East Coast? 1410 - 1445 Compilation of Actions: What Achievements Will Be Presented at the 2016 Technical Support for Coastal Resiliency TechSurge?